Don't panic. You didn't miss anything. Cheburashka is simply an alternative name to teddy bear coat. I just find the cheburashka name to be more cool. 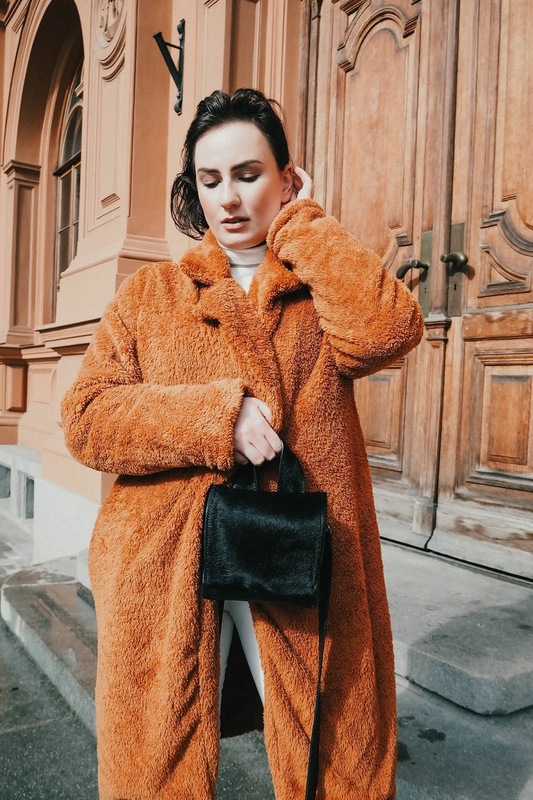 Teddy bear style coats have been around for several seasons now. And it's not a surprise. The main reason why everyone's so crazy about this type of coat is pretty simple - it looks and feels pretty cozy. Plus it's a sort of an alternative to simple coats and fur coats. Well, I was trying hard not to fall for this trend. But, as you see, I gave up. 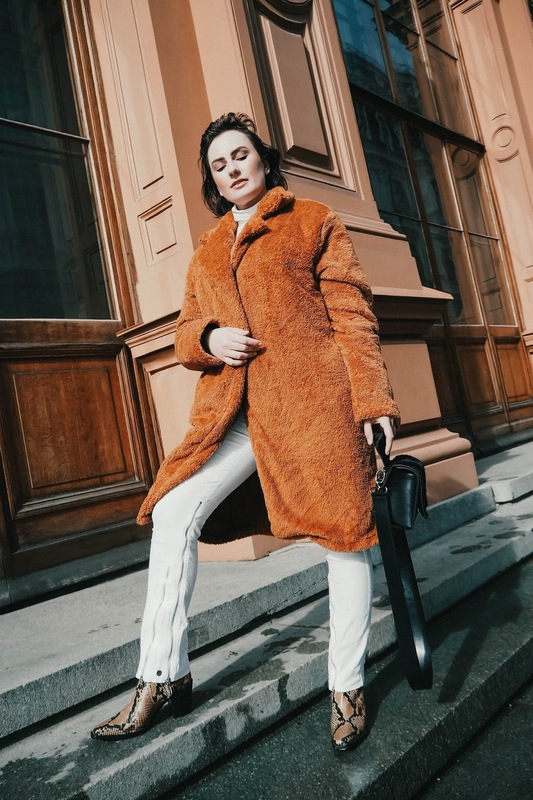 I gave up when I discovered this teddy bear coat on Shein website. It looked so good. And I was considering between coffee and army green colours. As you may have noticed, the coffee one won the battle. Though under the strong Spring-ish sun it has this orange shade. 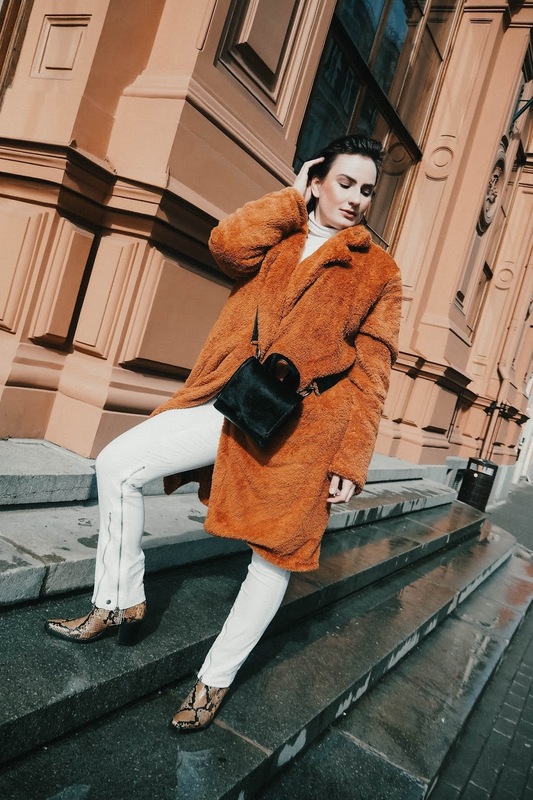 If you google it properly, you'll find like a dozen, or even more, ideas on how to style this style of coat. I decided to go for light shades in terms of colour. I like the match this cheburashka coat makes with white stuff. And, of course, I couldn't escape the snakeskin trend. These boots are one of my main seasonal investment and I can't stop matching it with various outfits.